On November 19th, 1918, two young men were making rounds of Toronto in a rented horse buggy. They pulled up to 372 College Street, Madame May's Clothing Shop (it's now She Said Boom, a used book and record store). The men tried striking a deal with Mr. May, the shop owner, to sell a quantity of furs at a price well below their value. Mr. May became suspicious: he telephoned the Claremont Street police station to report his concerns. Detective Frank Williams, aged 24, responded to the call but the two young men had already left the store. Mr. May mentioned that he recognized the horse buggy as being one belonging to Cross's Livery, located at the southwest corner of King and Bathurst Streets. Detective Williams set out to find the pair, who he suspected to be selling stolen goods. Detective Williams beat the buggy's occupants back to Cross's Livery: he waited in the stables without backup. When the two arrived to return the buggy, Williams collared them and led them into the darkened livery office. In the office, out of public view, there was a struggle, a scuffle. Three shots rang out - one of the suspects ran out the door and into the street. This man was Albert Johnson. He escaped on the King streetcar and was never seen again. Back in the office, the detective and the other suspect continued to battle. The detective, whose pistol was still in its holster, was bludgeoning the man in the face with his baton. Two more shots were fired - both struck the detective. When Detective Williams collapsed, the suspect ran out of the livery and eastwards on King Street. He was tripped and held by a newspaper boy until another officer arrived to handcuff him. Meanwhile, Detective Williams had died of his wounds. He was the very first Toronto policeman to be killed in the line of duty. The one suspect that had been apprehended was taken back to the Claremont Street station. He confessed to shooting Frank Williams. While being questioned, the suspect said that his name was Frank McCullough, he was 26 years old and he was from Brooklyn, New York but currently living at 177 Palmerston Avenue. McCullough was already a well-known character in the neighbourhood since he drove a bread delivery wagon up and down the length of Spadina daily. By all accounts, he was outgoing and feisty, witty and intelligent, very tall with unusually bold blue eyes. McCullough was already known to the police, too, as he'd been arrested before for housebreaking in 1917 and had been to prison. He smashed a whiskey bottle over the head of the arresting officer during that episode. On November 27th, 1918, a preliminary inquiry was made into the death of the detective. McCullough represented himself in court and surprised everyone with his abilities. The accused attempted to prove that he'd shot the detective by accident, without forethought. Nevertheless, it was judged that McCullough acted willfully and the case would proceed to trial. During the trial of The King vs. Frank McCullough in January, 1919, the jury found themselves sympathizing with the defendant. Most of the jurors later said that they believed McCullough did not intend to kill but that he pulled the trigger only because of Detective Williams' force with the baton. The general consensus of the jury was that McCullough was guilty of manslaughter, not murder, and that he should be spared the death penalty and given life in prison. However, the Criminal Code was clear in the matter: killing a police officer while averting arrest was always to be charged as murder, never manslaughter. 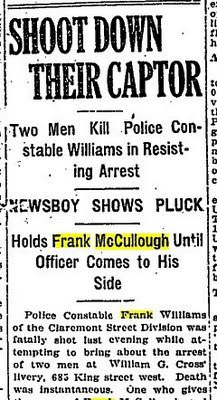 Therefore, Frank McCullough was found guilty of murder and was sentenced to hang on May 2nd, 1919. 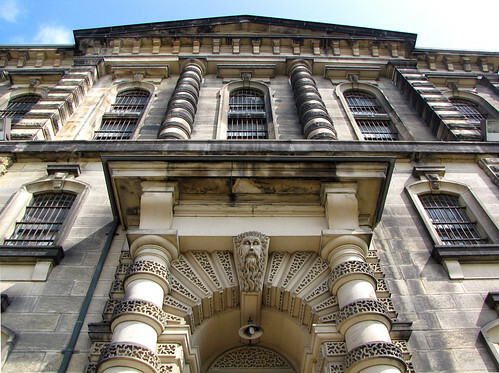 The prisoner was taken to the death watch cell at the Don Jail to await his execution day. Read Part 2 of this unbelievable but true local story.